Et Verbum: Simple instructions On The Holy Eucharist As A Sacrament And Sacrifice by The Very Rev. Geo. Edw. Canon Howe. Part 16. Simple instructions On The Holy Eucharist As A Sacrament And Sacrifice by The Very Rev. Geo. Edw. Canon Howe. Part 16. After forty centuries of time, during which men had honoured God, by offering Him sacrifices of oxen, fruit, and wine, the Old Law at length came to an end and was altogether abrogated, the New Law now taking its place. With the abolition of the Old Law, the Jewish sacrifices were no longer pleasing to God, and they too were now to cease ; they had fulfilled their purpose—the typifying of the great sacrifice of the Law of Grace—and from that fact had derived their value and merit before God. Sacrifice, as we have seen, is the essential and divinely revealed form of the worship of God, the central act of Religion, and as the Old Law had its offerings of many kinds, so in the New Law, sacrifice must still be found ; this sacrifice is the Holy Mass. The name "Mass" is derived from the Latin word missa, itself a contraction of missio, which means a dismissal, or sending away. One dismissal of the people took place, in the early Church, after the Gospel; those who were known as Catechumens, converts either from Paganism or Judaism, had to leave then, without assisting at the remainder of the service. Catechumens were they who had abandoned the Synagogue and were being instructed in the truths of the Christian Faith, by way of preparation for admission to Baptism. The Church jealously guarded against their gaining any knowledge of the sacred mysteries, till their instruction was about completed, and their sincerity fully tested; hence, after hearing the Epistle and Gospel and an explanation given upon them, the Catechumens were dismissed from the Assembly as being unprepared yet to see or hear more of the sacred Liturgy, and unworthy to be present at the solemn act of sacrifice. This rule was known as the Disciplina arcani, the " Discipline of the Secret," which kept from all, save the initiated, the more solemn parts of the Church's services and doctrines. A relic of this practice is very common, even to this day, in the Church : thus, for instance, in many of her ceremonies and in the Divine Office, the Pater and Credo are not said aloud, but only the first and last words of each; for the Faithful were alone permitted to know this prayer and the profession of faith ; hence, they were not said aloud in presence of the Catechumens, and this silence is still observed. When the Sacrifice was fully concluded, the deacon used to intimate to the Faithful that they might now disperse, and addressed to them the words that still remain in use : Ite, missa est: " Go, Mass is ended." Thus there was the Mass of the Catechumens, and the Mass of the Faithful. In course of time, the Discipline of the Secret fell into disuse, exclusion from the sacred mysteries ceased to be enforced, and the entire service came to be known as the " Mass," word retained to this day, " Liturgy" being the name used in the Greek Church. Now the Mass is a true and real sacrifice, according to the definition already given, as may be seen from the following points, showing how it has all the essentials of sacrifice. 1. In the first place, there is a Victim, the invisible Body and Blood of Christ, under the visible forms of bread and wine. A change in the victim is effected by the twofold consecration of these substances by which it is mystically slain or destroyed. For, by virtue of the words only of the consecration of the bread, as distinct from the consecration of the wine, the Body and Blood of Our Lord are separated from each other, which implies death, for the body cannot live without the blood, and thus they are offered to God, as a victim sacrificed to the honour of His name. 2. There is also a lawful Minister. Jesus Christ is Himself the invisible High Priest, offering this sacrifice, as He offered that of the Cross. He is called a priest according to the order of Melchisedech. That patriarch of the Old Law offered sacrifices of bread and wine, of all the Scriptural types the most representative of the Mass. But there is likewise a visible priest, duly ordained and set apart for the purpose. For sacrifice is an outward act or ceremony and needs therefore a visible minister for its performance. He shares the priesthood of Our Divine Lord, and in his ordination receives power to offer up Mass for the living and the dead. 3. The Mass is offered to God alone. We have seen how sacrifice is a distinctive act of worship offered only to God and never to any created being. Thus is it with Holy Mass; only to God is it, or can it be, presented, not to any of the Saints. It may be offered in their honour, but finally it is only to God that this supreme act of worship is paid. Thus, as the feast days of the year are announced to us Sunday by Sunday, Mass is said in honour of the Saints, but to God alone is the sacrifice directly offered. 4. The Mass is offered to acknowledge God's supreme dominion over us, and our absolute dependence on Him for all we have or need. We acknowledge this dominion by the mystical destruction of the victim, through the twofold consecration, the words of which have been called the "sacrificial knife," slaying the victim on the Altar, which denotes Gods right over the life of His creatures. Hence, two outward species are needed for the sacrifice of the Eucharist, bread and wine, while one species only is sufficient for the Sacrament of the Eucharist, as we receive Our Lord whole and entire under each form separately. This is the great sacrifice of the New Law, foretold and prefigured so often in the Old. 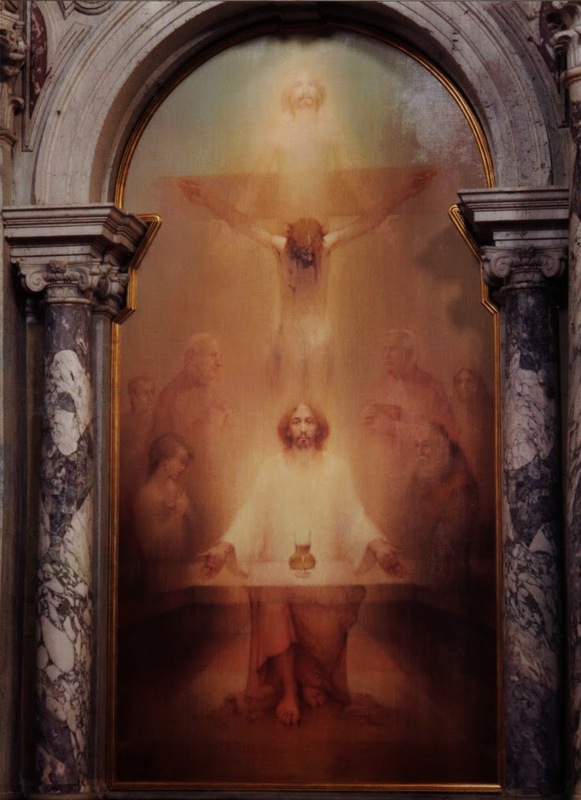 All the ancient sacrifices received their power to please God from the fact that they were types of the Holy Mass; it is the "clean oblation," spoken of by Malachy, the last of the prophets (Mai. i. 11). Even under the Old Covenant, the sacrifices of food and fruit were esteemed more highly than those of animals, as the latter savoured of sin, blood and defilement. Bread and wine, produced from grains of wheat and grapes of the vine, are most excellent gifts of the earth to man, and thus are the " clean oblation," on account of their simplicity and absence of any noxious ingredient. This same Holy Sacrifice also fulfils the prophecy as to time and place of offering. Under the Old Dispensation, Sacrifice was offered morning and evening only, and only in the Temple, but Holy Mass in the New Law is continuously and everywhere being offered to God ; night and day without cease, in one country or another, from the rising of the sun to the going down thereof, it is offered to God's name, and His glory is proclaimed among the nations. Illustrative examples may easily be found by means of a simple calculation. For every 15° of longitude east or west of Greenwich, the day will be an hour before or behind us. Hence, with the aid of a map, a wide range of countries can be named in which Mass can be offered, when the hour for offering it with us is passed. Thus, while our last Mass on Sunday is being said about n a.m. the early Masses are just beginning in Canada and South America. And so, for other hours and other countries, the Holy Sacrifice is being continually offered to Heaven. " From the rising of the sun even to the going down, My name is great among the Gentiles, and in every place there is sacrifice, and there is offered to My name a clean oblation" (Mai. i. 11). Thus is the Holy Mass the great ordinance of God, designed from the beginning to give Him honour and glory, and to give grace and salvation to the souls of men.—Holy, indeed, as being the most sacred and sublime act that mortal man can offer to his Creator, far exceeding the merits and sanctity of the oblations made under the Old Law. Saints indeed have trembled at the thought of having- to offer it, while of many it is recorded that they hid away in the mountains, or even mutilated themselves, that they might not be called upon to offer the tremendous sacrifice, for which they deemed themselves unfit and unworthy. Because of the dignity and holiness of the Mass, the Church surrounds it with all the pomp and splendour she can command. Nothing can be too great or too noble in the way of richness of vestments, beauty of harmony or stateliness of ceremony, where the honour of her Divine Founder is in question; and the greater the Festival, the greater, too, are the efforts she puts forth to this end. Herein the Church teaches the Faithful practical lessons : that they must ever regard the Eucharistic Sacrifice with the eyes of lively faith, be anxious to assist at it as often as their circumstances may allow, and never be guilty of any form of irreverence while it is being offered. How well the Saints took these lessons to heart! Being in the employ of a Spanish farmer, S. Isidore yet contrived to get to Mass every morning, though he had much to bear from his employer and others in doing so. A graceful legend says that one morning, while he was still at Mass, his master, going into the fields, found two oxen, guided by an angel, drawing the plough behind them. From that time forth, far from preventing Isidore from going to church, his employer gave him every encouragement to go, and thanked God for giving him one who brought Heaven's blessing on the farm. Not on Sundays only, but every day of the week, S. Zita, a humble domestic servant, was accustomed to hear Mass, getting up early for the purpose, so as not to neglect her household work. Her fervour and demeanour during the Holy Sacrifice were most angelic ; it was then that she drank in the courage she needed for her trials, and received those abundant graces, which raised her finally to such a high degree of sanctity. Though Chancellor of England, with many occupations, Blessed Thomas More heard Mass every day. Once a message was brought to him from the king, requiring his attendance on a matter of importance. " A little patience," replied the Chancellor ; " I have not yet completed my homage to a higher Sovereign, and I must await the end of the Divine audience." In our own humble measure, let us endeavour to imitate the Saints, and we cannot fail to reap for ourselves many benefits, both spiritual and temporal, while to God we shall give the highest glory He can receive at the hands of men.